If you are a business owner, then your business is one of the most important things in your life. Your business is something that you’ve poured time, money, energy, and so many other countless incalculable resources into. So, when it comes to keeping your business secure, why skimp on security measures? Do you know what locks are best for your business? How well do your locks and security systems function? Do they need maintenance? Here are a few of the most common locks that modern business owners use to secure their business. Before we dive into the rest of our post, be sure to check out a couple of our recent posts about panic bars. Panic bars are fairly common within modern commercial buildings. Installing panic bars is a security measure: Not only will they keep your customers safe, but they may also protect you from a lawsuit and decrease your business insurance premiums. Find out more about the history of panic bars, their benefits, and if they’d be right for your business on our blog. The deadbolt is a common locking mechanism due to its widespread use in residential communities, and there is a good reason why. It is simple, but effective. A deadbolt works as an effective deterrent to anyone who would want to break into your business because it can be locked on the inside and outside. It is also a very heavy duty mechanism, not easy broken. Most vandals or burglars will look for the easiest option for their break-in. If they cannot gain access to your business within 10 minutes or fewer, they will move on to find another victim. A deadbolt is a reliable and effective security mechanism for many businesses. Padlocks are best for businesses with garages or warehouses. Padlocks have been around for many years but still prove to be a reliable security measure for many industrial businesses. Though the traditional padlock that uses a key is useful, there are also digital padlocks on the market, as well. 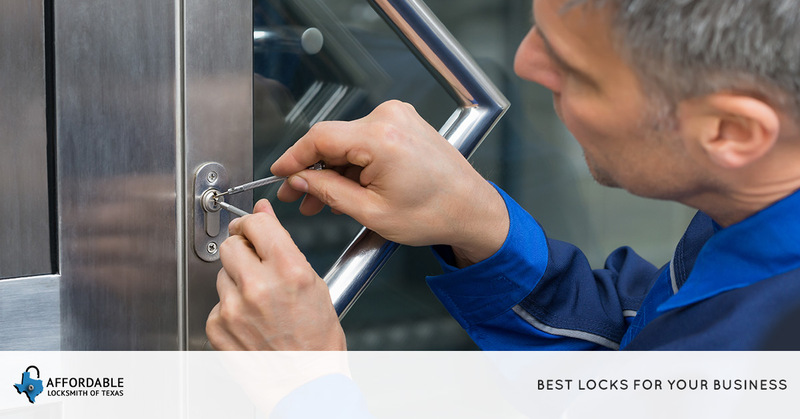 For the highest level of security, contact your local locksmith in The Woodlands to find out what type of padlock would be best for your business and have them install it. Want to know more about key duplication and how to have the highest level of security? Read our past post about key duplication. IC cylinders, which stand for interchangeable core cylinders, are another great option for business owners to consider if they use physical keys for their business and have to change out their locks regularly due to employee changes and other similar situations. All that a locksmith has to do to rekey your lock is change out the cylinder. These types of locks also often offer business owners more security options while still remaining easy to change out when the need arises. Usually, these locks are found in lever handles, which can be very useful for efficient workflow. Mortise locks have, in the past, been those that have been found in older buildings, but we are seeing a resurgence in their use in both the commercial and residential sector in the U.S. Mortise locks, also known as a sash lock, use level locks as the locking mechanism. This type of lock can be beneficial for commercial doors, entry doors with glass, and apartment doors, and can vary greatly based on the type of hardware used with this lock. If you want to know more about the benefits of the mortise lock, be sure to contact your local locksmith to learn more about this lock and if this type of lock is best for your business. Electronic locks are a great way to not only keep your business safe, but to also know exactly who is going in and out of the building. Electronic locks tend to lower your risk of a break-in which can lower your insurance premium. Also, if you use key cards or a similar type of electronic key, you can know exactly who is swiping in and out of your building and when. If you have questions about inventory discrepancies or other employee activity, just check your locking system to find out who was in the building at the time of the incident. Electronic locks can give businesses another advantage in that, if you let an employee go, simply deactivate their card: No longer do you have to worry about collecting key copies from employees. Are you looking to increase the security of your business or are you curious as to how your business’ security measures up? Contact the locksmiths of Affordable Locksmith of Texas! We would love to help you have the best security that is available to keep your business in The Woodlands running well and keep your investments safe. Contact us today to get information about our services and what is the best option for you! Already know what you need? We can install it. New clients get 10 percent off their first service! Have you found yourself locked out of your business? Don’t panic! Our 24-hour locksmiths are just a call away. Contact Affordable Locksmith of Texas the next time you find yourself locked out of your car, home, or business in The Woodlands and we will respond within 15 minutes of your call or message.